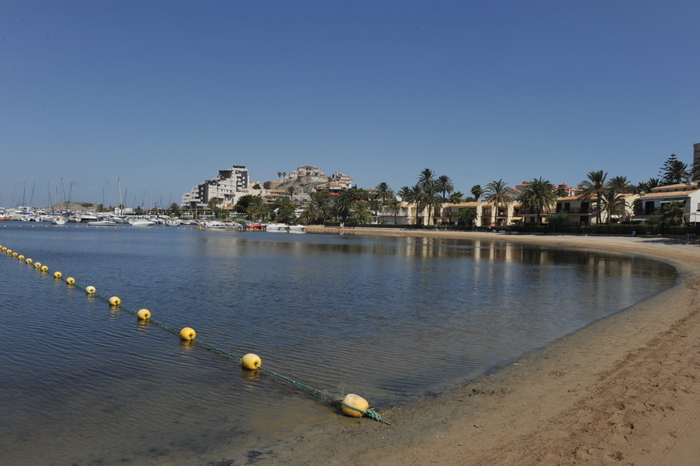 The Darsena de Dos Mares is a very important little sporting beach for all those who enjoy kitesurfing, windsurfing, dinghy sailing and stand-up paddle. There are schools here offering courses, shops selling equipment nearby and hire facilities. 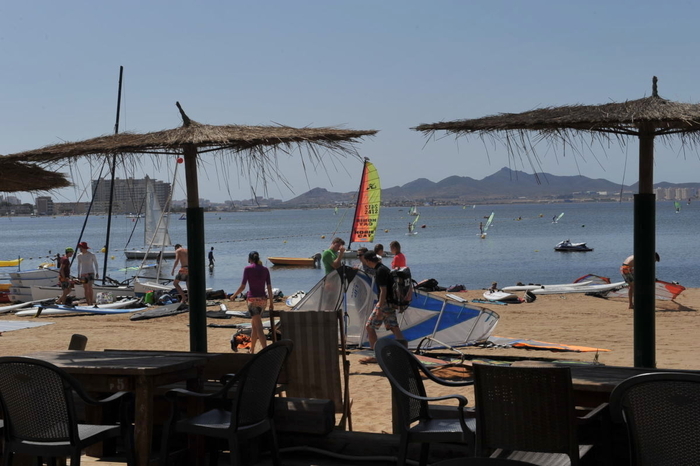 Winds in this corner of the Mar Menor favour kitesurfing and the prevailing winds tend to blow perpendicular to the beach, so regardless of whether the wind is on-shore or off-shore, it’s still perfect for kite-surfers to zip up and down along the front of the beach. The water in this corner is also very shallow, so is perfect for learners who are going to fall off their boards frequently in the early stages of the learning process; it’s much easier to get back on a kitesurf board in shallow water and the fins are very small, so boarders have plenty of space to learn with less probability of a collision with another board as the water is shallow a good way from the beach. 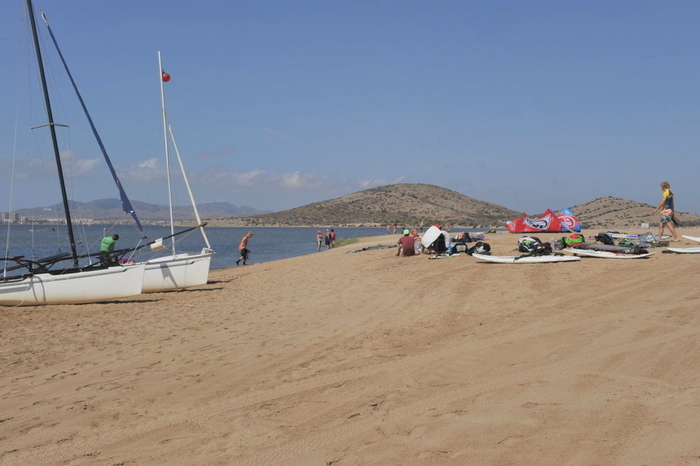 Schools and shops selling equipment have migrated to this corner as a result, so if you’re looking for watersports equipment hire or tuition, then this is a good corner of the Mar Menor to head for. More experienced windsurfers also tend to make the run across from this corner to the La Manga Caravanning Park and Playa Lomas del Castillico when the wind is good and back again. Other leisure sporting equipment can be hired from this corner, including kayaks, equipment for stand-up paddle and pedaloes. Cool bars always go hand-in-hand with watersports, as enthusiasts will generally spend more time waiting for good winds than sailing, and there are a couple of really nice chill-out bars on this beach. “Windsurfing widows” who spend their holidays waiting for wind so their partner can sail and then waiting for the wind to stop so their exhausted partner can return to dry land and fall into a dead-beat sleep for the evening, are also well-catered for, as there are hire facilities for loungers and sunshades and this beach has one superb natural attraction to boot: free beauty treatments. These require some effort, but are well worth it, as Mar Menor mud leaves the skin feeling rejuvenated and these muds have been famous for their healing properties for thousands of years: the Romans are certainly known to have availed themselves of the healing Mar Menor muds. In order to reach the mud, it’s necessary to wade across from the tip of the beach to the Isla del Ciervo, which is a real adventure as the water reaches waist height only and it’s a good half kilometre across. Once on the island, follow people caked in black mud to the correct spot to dig out a small amount, try a little test patch, and providing the body doesn´t display any signs of reaction, apply liberally, allow to dry, then wash off. Please be aware that it is not a good idea to bathe anywhere near windsurfers and kitesurfers. When they don't know what they’re doing, kites and sails are dropped regularly and being clobbered by a falling boom, a plummeting kite or an out-of-control board is not only painful, but can also be fatal! Once they know what they’re doing, it’s just as dangerous as boards can travel at high speed: being hit in the body by a kitesurfer lifting off the water can be fatal, being run over by a windsurfing board travelling on a high speed plane can be fatal, as windsurf boards have a deep skeg beneath them which cuts through the water like a blade and is very sharp. There have certainly been cases of snorkelers being severely injured and killed by windsurfing boards travelling at speed, so if you only want to bathe, it’s advisable to choose a beach well away from these activities, or keep a close look-out and be aware of what is going on around you. In this case, there is a nice curving corner of the beach netted off to protect against jellyfish for swimming only, so stay in this area if you want to bathe safely. The beach itself is semi-urban, 300 metres long and 15 wide, with fine, golden sand. Facilities include drinking water, footwashes, bins and shaded areas, most of them provided by the restaurants and bars along the beach. 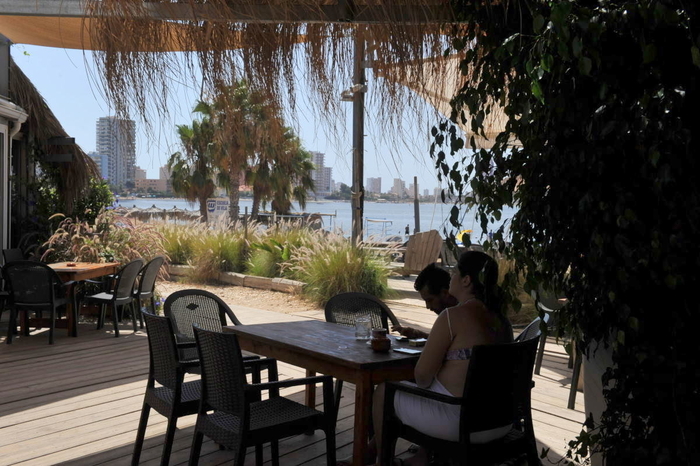 The beach is located at a point where the carriageway running the length of La Manga del Mar Menor splits into two sections to go around a central block of residential accommodation, which means the beach can only be accessed from the northern carriageway. This is kilometre 3, so those driving from km 0 will have to double back on themselves by taking the left filter lane just as the road opens up, past the area of dense development. Parking can be challenging. Out of season there’s no problem , but during the peak weeks it’s often necessary to park wherever possible and walk back until you get your bearings and identify a couple of parking spots right next to the beach which are often empty as everyone who doesn´t know they exist parks where they can and walks. Urban bus services run up and down the Gran Vía all day. However, it does also have wind, the other essential ingredient for sailing, and in the morning this is gentle and steady, perfect for beginners, with thermal winds coming through in the afternoons, perfect for improvers.